You no longer need a weapon to confront the dangerous bosses because with this suit you will become invincible. 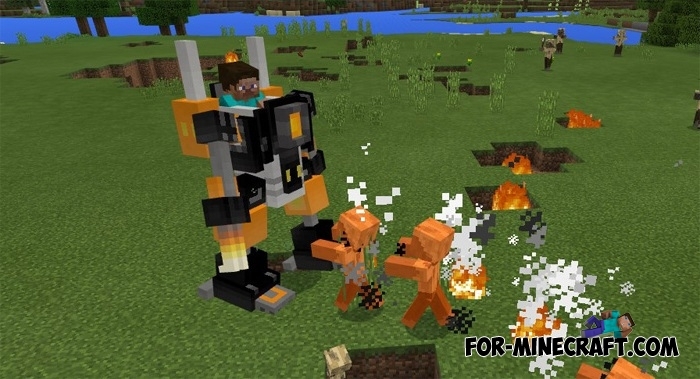 The Robot suit addon is a military exoskeleton equipped with powerful defensive elements that guarantees victory in any battle, except when several bosses attack you at once. This robot has one place for the pilot and obediently performs all the commands. It has a cannon firing powerful fireballs and also fists to repel close attacks. The addon does not contain crafting recipes, but it does not mean that it will be difficult for you to get it. Just build a sculpture to summon golems and sit inside the robot. It can jump high and run fast, and the robot makes new sounds. During fights with hostile creatures, you do not get damage but only until 300 health is spent. 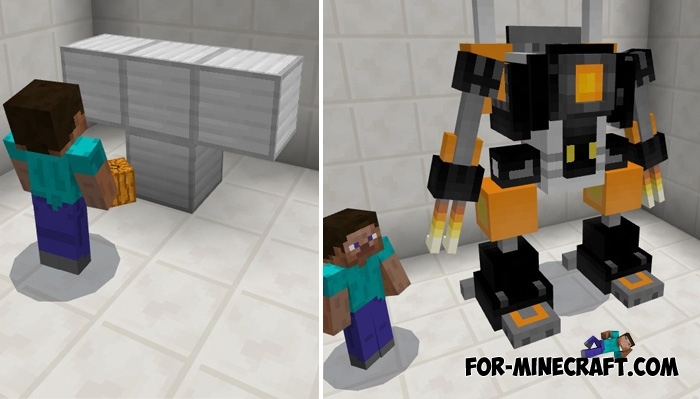 For today there are no opponents in Minecraft Pocket Edition who can defeat this exoskeleton if the fight is equal. And if you want to really harden yourself in battles, then additionally install the Darkened addon or any other one where everyone dreams to destroy you. The Darkened addon (Minecraft PE 1.1+)Surely you are bored playing a single game because only a few creatures can defeat you in equal fight..
TNT Cannon for Minecraft PE 1.0.0Do you have a castle, but you do not know how to protect it from the other players?